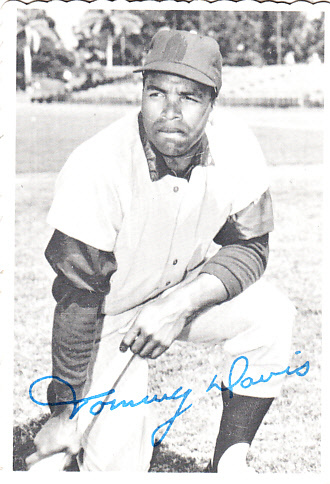 Tommy Davis parlayed good contact hitting into an 18 year career, following his LA prime (1960-67) with stops in 9 other cities, including four 1960s expansion clubs (Mets, Pilots, Astros, and Royals). His best "skill," assuming you put stock in it, was his clutchness. Of the 254 players to drive in 1000+ runs, Davis ranks fifth all-time in situational Win Probability Added at 7.5; only Tony Gwynn, Pete Rose, Yogi Berra, and Bill Buckner were better (full results). Being "clutch" is a pernicious reputation to have when you can't field or run well, the latter thanks to a 1965 broken ankle. 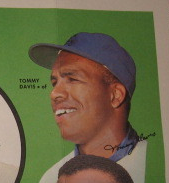 A team with long-term planning wants more prospects than spot performers, so Tommy appeared on a lot of transaction sheets after leaving Los Angeles in 1966. 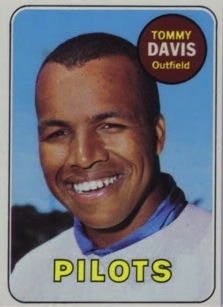 So many, in fact, that even though Topps included Davis in five different 1969 sets, all used photos several years old, starting with the base set. Oct 15, 1968: The Seattle Pilots pick Tommy during their expansion draft. These days, an autumn transaction would give Topps plenty of time to snap photos at a "uniform debut" press conference or spring training, put it on cardboard, and be ready for opening day. But Tommy Davis isn't wearing a Pilots uniform. It's not even a Mets or White Sox jersey, the teams he played for between LA (1958-66) and Seattle (1969). So why did Topps recycle a hatless photo already seen on 1967 Topps #370 and 1968 Topps Game #10? The MLB Players Association started humbly in the mid-1960s, without much negotiating leverage or legal success challenging baseball's reserve clause. What they could control beyond the field of play was licensing of player images for advertising, products...and trading cards. When the MLBPA instructed players to refuse new card photos in 1968 (pending a license fee increase), Topps dug into their archives to cover active players on new teams. 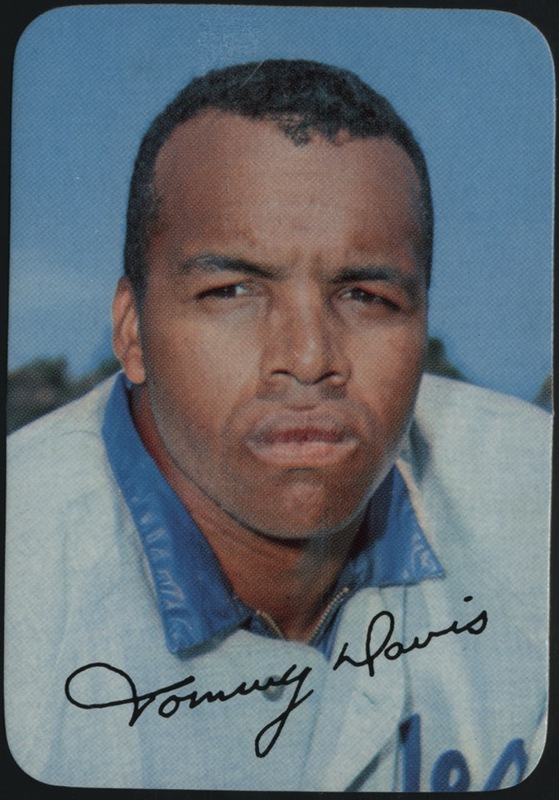 Many late 60s and early 70s sets look bland and static, thanks to dozens of hatless or airbrushed portraits; Topps did a little of both to all these 1969 Tommy Davis cards. Dropping Tommy's hat couldn't mask that we're looking at the same mid-60s Dodgers jersey and warmup jacket in 1969, complete with Los Angeles script. The 1969 Supers test issue re-used the photo from 1968 Topps #265, with cropped-out jersey script. You can make out the obscured "LA" here, but it's otherwise almost identical to Tommy's hatless shots above. In all likelihood, every 1969 photo came from the same mid-60s Dodgers spring training in Vero Beach, Florida. 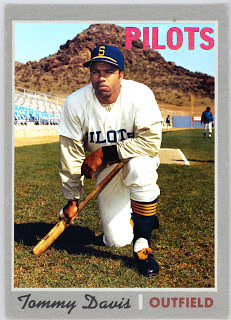 None of the players on the Seattle team poster wear Pilots hats or jerseys, but their blue and gold colors made Tommy's LA gear an acceptable airbrush option for Topps editors. Hard to tell if they used the same looping signature for both the Super and team poster sets, but they might've had several of those to choose from. 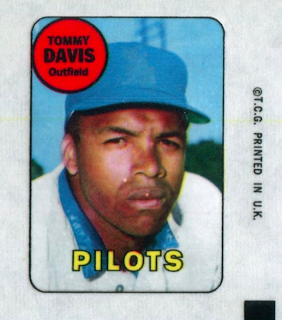 At last, Tommy Davis as a Pilot! It's not the "real" 1970 card, though, it's a custom creation by GCRL, shared to his blog in 2012. 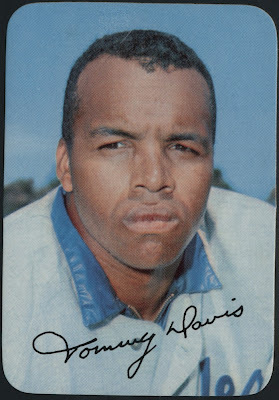 (Seattle traded Davis to Houston before the end of 1969, so Topps put him onto a featureless "Astros" uniform). GCRL also cataloged the full list of Tommy's transactions, according to Topps. You don't often see five different archive photos for one player in one year, and if anything identifies late-60s Topps baseball for me, this is it. As seen on 1969 OPC #5, Ken Harrelson received near-identical treatment that year. If you've got a favorite "years out-of-date" look from another card, let me know in the comments.